It came up with the bizarre Selfie Spoon last year so you kind of knew any follow-up contraption would be equally absurd. And we were right. 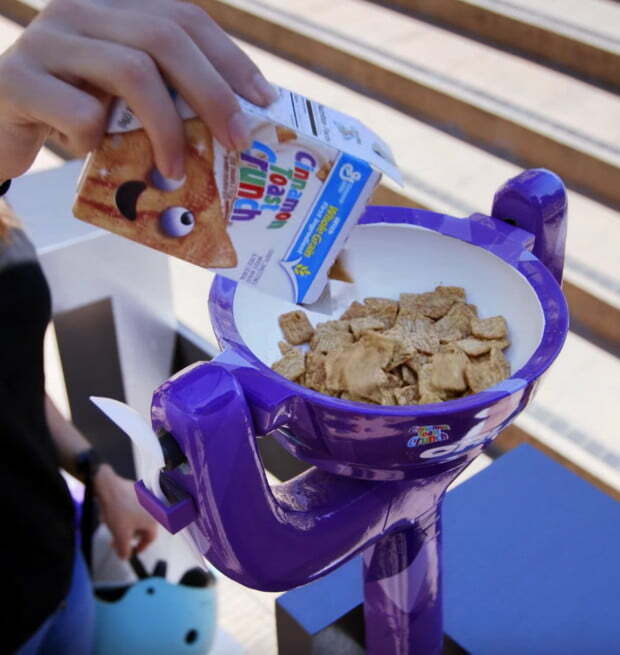 Part hoverboard, part cereal bowl, and part bonkers, the Cinnamon Toast Crunch Cruiser from food maker General Mills is a hoverboard with a built-in cereal bowl. That’s right, if you’re too busy to knock together a bowl of cereal before leaving the house for work, you can ride to work and eat at the same time. No, you won’t look silly at all. Pitched as the “ultimate solution for multi-tasking millennials,” the machine incorporates an ingenious “self-leveling bowl” for ease of use, and vital “spill-shield technology” to prevent a mess while riding. It even has a slot for your spoon. Now, in case you’ve taken leave of your senses and are at this very moment shouting, “So tell me where I can buy this darn thing,” we’re sorry to inform you that, although the Cruiser does actually exist, it’s not for sale. Yes, it’s merely a marketing exercise focused on boosting sales of Cinnamon Toast Crunch and, more broadly, at getting cereal back on the breakfast table (or on a hoverboard?) following years of declining sales.